A nominee must be an outstanding club member who has made significant contributions to the mission and operation of the club and to one or more Avenues of Service. The ‘Rotarian of the Year’ award is given to a member who exhibits “Service Above Self” in daily activities and who promotes Rotary by actions and involvements. This may be accomplished through one major activity in club service, in multiple activities, or by serving on several committees. This person should be highly visible in the weekly activities of the club. The following list of criteria is presented to illustrate the range of things that are considered when selecting a person for “Rotarian of the Year”; however, the decision is not limited to these items, nor are the items on the list be considered mandatory for selection. To be considered, the candidate must have been a member of Whitnall Park Rotary Club for at least one full year. The nominee must be a member in good standing, i.e., dues current, etc. The nominee must have active membership status. 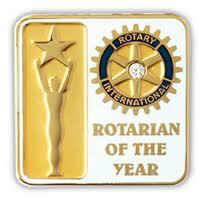 Honorary Members or those on a Leave of Absence are not eligible for the award. The nominee should have an exemplary attendance record. While perfect attendance is not a requirement, the nominee should either regularly attend club meetings or complete make-ups when they are unable to attend. The nominee has been involved with service projects that have been undertaken by the club through active participation and support. The nominee has been involved with fundraising projects that have been undertaken by the club through active participation and support. The nominee has participated in additional club activities that help to strengthen the camaraderie of the club, such as social events. The nominee has contributed to the day-to-day workings of the club by helping with the tasks necessary for the club to function effectively. The nominee has attended Membership Development, Foundation Training, or a Public Relations seminar(s). The nominee has held an office, served on the Board of Directors, or worked on a committee for the club. The nominee has taken an active leadership role within the club. The nominee brings visitors and/or candidates for membership to the club and/or has been an active participant in the club’s membership drive. The nominee has worked on a District-level committee or held a District office. The nominee has participated in or helped to facilitate a District or RI program such as Group Study Exchange, a Global Grant, or a District Grant. The nominee has attended the District Assembly, the District Conference, the RI Convention, and/or other District and RI gatherings.